We headed off to Mary Arden's Farm again this weekend which was hosting a folk festival. We didn't really stop to enjoy the music but did hear a kids open mic from a distance which sounded fun. We (naturally) made a beeline for the cows, so M could check on the calves. We fed some sheep and then checked on the (very big) piglets and the goats. Then we found the jester and that's where we stayed for a while. M tried out a Pedal Go, with a lot of help from me. This is a simple toy described by the jester as the first step on the way to learning how to ride a unicycle. It had two foot plates or pedals set directly onto wheels which you had to stand on, pedal and go. M didn't quite have the weight or oomph to make it go by herself, but she gave it a good go. Dave meanwhile showed us how to walk on stilts, did tricks with a peacock feather and tried his hand at plate spinning. M also had a go on the stilts, with me holding her on and moving the stilts for her. She also tried plate spinning with help from Mummy. Sorry no photo's though, my hands were busy helping M so I didn't get a chance to whip out the phone! A while later we headed to Mary Arden's house to check on the wells and garden. After that we stopped by the spinners and weavers again and this time M was fascinated by what they were doing. She was very taken with the spinning wheels and the peg looms. M had a go at the latter but the table was too high for her to reach properly and as a just turned three year old she lacked the manual dexterity to weave the yarn between the pegs. M was very excited when I revealed that we do have both a spinning wheel and peg loom in the house, saying she would have another go when we got home. Ahem... I think only a spinner would understand how nervous I felt at the idea of letting a three year old loose on my wheel. I did my best to be non-committal and changed the subject, hoping M would forget the whole thing. M has a very good memory and reminded me about the wheel that evening. Rather reluctantly, I pointed it out where other sat under a dust sheet behind the television (well away from little fingers) and brought it out to little cries of "Oooh!" from M.
I spent about half an hour talking about the different parts of the wheel, bobbins and demonstrating treadling. M insisted on having a go, sitting at the wheel with her foot riding the treadle as I spun the wheel slowly. After that M helped change a bobbin and we sang Wind The Bobbin Up. M was satisfied. I put the wheel away and sighed inwardly with relief. All things considered, M meeting my wheel for the first time went very well. 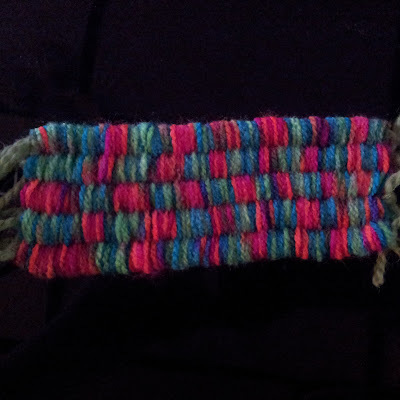 Our first attempt at weaving on the weaving sticks. I chose the weaving sticks over the loom for this first go because there are only five sticks in the set which made it a lot quicker to set up than the peg loom. M was very interested and had a go at the weaving as I guided her hand around the sticks, before allowing me to take a turn. M took charge of pulling the sticks up when they were about 2/3 full and a short while later we had our sample swatch. M put her scissor skills to good use and cut the warp threads for me so I could tie them off. 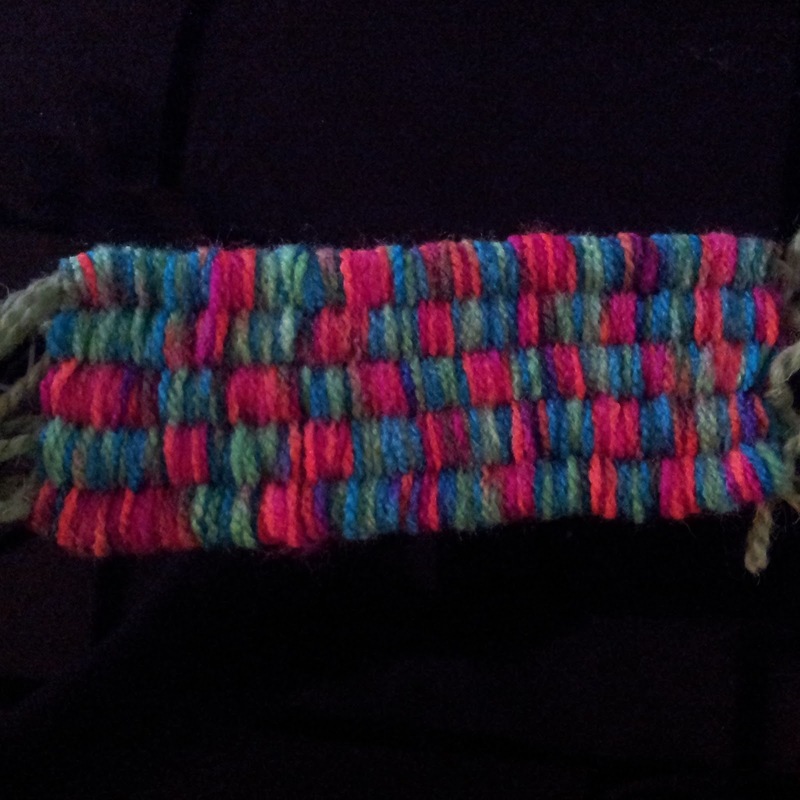 I'm now wondering what I could make with two inch strips of stick woven fabric!